It's road trip time. You're driving down the highway watching the landscape change as you travel. You notice houses, trees, animals, the sun rising or setting. You listen to the music on your radio. Stick your hand out the window and feel the power of the wind move around it as you get lost in the ride. And that's when it happens. That "ding," that warning light, that indicator that is suddenly, magically, inexplicably suddenly hanging out with E.
Sometimes I feel like life gets that way. We get up and walk through our days. We focus so closely on what we are doing, what's coming next, that we miss the fact that we are running low on fuel. That pretty soon that car is going to come to a stop and you are going to be stuck. 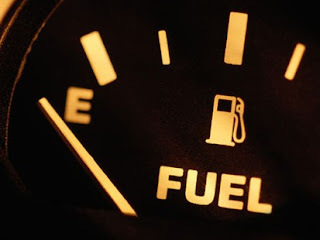 I've felt like the power has been running out, that my gas tank has been hovering near empty and I haven't done anything about. Sure I take a day to do not much of anything. But I've been feeling sick so it hasn't really refilled the tank. Just given it a gallon to get through the next day. But the last couple days I have some good times. I spend some time at an educator conference with a friend getting some free stuff for my classroom, had lunch at a cool cafe, visited a market where I was slightly uncomfortable (but it was good for me). Then I took a road trip to my college town. My best friend, Ms. K, and I have gone together several times over the last few years but she couldn't g o my mom offered to join me instead. So we hit the school bookstore, the local bakery, a winery, a pizzeria... some of my favorite places. And it was fun. It was relaxing. I tried not to think of work, or the "case of the busies" that seems to be affecting many people lately. I feel as though the gas tank is off of E, which is nice. It's not a full tank... but I now recognize that I need to keep an eye on that needle. Making sure that I'm refilling, recharging as necessary. Make sure you do too.